Bella’s Italian Restaurant has been under the care of the Simmons family in Banner Elk for nine years this June. 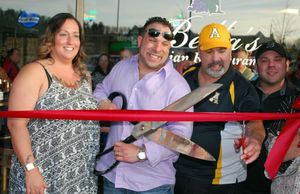 After nearly a decade of family-style Italian food, Bella’s management made the decision to expand to Boone, a venture the family had always considered. Bella’s Boone has been open since March 24, and manager Lisa Carson has brought with her a strong desire to continue the tradition of family-style dining. In fact, Carson has suggested in the near future featuring a family-style dining night where guests help themselves from shared Italian dishes. In her years of being a restaurant owner and server, Carson has noticed a lack of family connection at dinner. She even jokes about the idea of putting up a sign that says “no cellphones” to encourage people to connect more. “I would go up to a table, and, literally, the entire family is with their head down on their phones not even paying attention to you,” Carson said. At Bella’s, family tradition is not only encouraged for diners. The restaurant features members of the Simmons family in the front of the house, kitchen and management. Bella’s was born nearly a decade ago, after patriarch Elliot Simmons decided to sell his Florida home and asked his children if they’d want to open up a restaurant together as a family. Since the siblings had worked at so many different restaurants, they figured they had enough experience to run their own place. Now, Bella’s has a unique Italian flavor with even more mixed into the menu. With the opening of the new restaurant, Carson moved from Florida to Boone with her boyfriend and chef, Brian Peterson, who brings 26 years of experience to the kitchen. In addition to experience, Peterson brings in his own flavor, with such dishes as bacon-wrapped pork chops. Bella’s Boone is located in the space formerly occupied by Joe’s Italian Kitchen (190 Boone Heights Drive). The new location held a grand opening ceremony on April 22, in which the Boone Area Chamber of Commerce welcomed the Simmonses to town. For more information, visit www.bellasboone.com.